Sam made his way to heaven this afternoon. 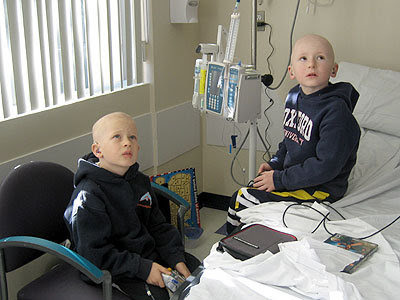 Max and Sam in the hospital getting chemo together as only kids can do. So, so sorry-just don't know what else to say. I am remembering the times I saw Max and Sam together. The picture of them with Trevor Hoffman. I had no idea my heart could break again. Just so sad sad sad. This is so sad. My heart aches for Sam and his family. For Sam because he didn't have the chance to grow up and be that special person he wanted to be. For his family because we know what they must now face...learning to live life without him. Heart aches all over again. They seems to watch something above them..